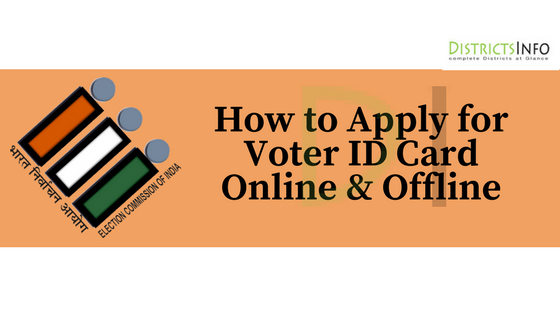 How to Apply for Voter ID Card Online & Offline - Simple Registration Steps: Voter Card is a very important document for Indian citizen. As India is the Democratic country, the country runs with the Government and the people of India have the right to vote to the right person as the government. To make the Voter Id card, one must attain his or her 18 years of age by birth. And thus he or she is eligible for casting votes to select the government. Also, check state wise election commission websites. Except casting a vote to select the government, voter Id Card to works as important documents for any legal works. Voter Id works as the permanent Identity proof for every Indian citizen and for creating any kind of official work purposes. So if you are a citizen of India and succeeding your 18 years of age then you are eligible to apply for your voter Id card. The voter Id can be applied either by online or offline easily to get your voter Id card. And to apply for voter Id card online and offline, here below are the easy steps by which you can easily create your own voter Id card immediately. To apply for voter card online is very Simple, once you have attained the 18 years of age you are ready to get your voter Id card. And to do so, you must go to the official site of Election Commission of India. To proceed the applying for voter Id card, follow the steps that we will discuss below. 1)The first thing to do for applying voter Id card is, go to the official site of Election commission of India http://eci.nic.in/eci/eci.html in your desktop or laptop. You can also select your preferred languages for operating the website. 2)In the website, you will find lots of stuff regarding the election and its functions of India. While under the categories you will find the Enrolment section, go to the enrolment and select the Become a Voter option. 3)Once you click on the Enrolment option, you will be redirected to the new windows where you will find a gate for logging in. There you have click on the new registration for getting your password and username. Once you complete your login process you will receive the password and username via email and mobile number. Now, Log into your account by providing the password and username for further process to create voter ID card easily. Now after logging in, you have to provide your full detail like name, father’s name, mother’s name, DOB, address etc. and make a specific password for your account. After submitting, a new successful page will appear which will include complete details about you and then you can download it for further use. The online applying for voter ID is done and you will receive an email for the confirmatory of successfully applied for new voter ID card. But those who have difficulties in applying for voter ID card through online can also apply offline for new voter ID card. For applying for voter ID card offline will take you to the official and traditional method of creating Voter ID card. All you have to do is download the offline form the official site of ElectionCommission of India and fill up the form by providing your details in the form including your mobile numbers. The form will ask for all the photocopy of each document mentioned in the form before submitting it to the office of election commission of your state or city. In this manner, one can easily apply for voter ID card through Offline methods and also all the required documents including passport size photo is must for the offline process. And all the work will be done in the office itself and when your Voter ID card is ready they will be sent in your given address by post. So above are the important details about how to apply for voter ID card Online and Offline. We have discussed the complete steps which are very simple too and any fresh or new applicant can easily perform the application and get their voter ID card very soon in few days. The online is more efficient as they consume lesser time and energy and easily you can get your Voter ID card through Post. Hope you have known the best and easy detail about online and Offline applying for voter ID card and easily you can create one in few days.